Helium has been a staple in many forms of welding for decades. It is an excellent shield gas for applications that require high heat input because of its effective thermal conductivity, and for high production environments where a higher travel speed is required. Helium is also well suited for welding thick material, because of its deep penetration profile. Most often, it is mixed with other gases to create a welding gas that exhibits the best characteristics of each component gas. It is often used in welding non-ferrous metals like Titanium, Aluminum, and Magnesium, and stainless steel. These are some of the same applications in which Argon is also used, but Helium needs a higher flow rate, and is significantly more expensive than Argon. Why is that? Helium is a by-product of refining natural gas. In the 1950’s, the U.S. government set up a refinery, specifically for the purpose of collecting it, which it believed would play a vital role in the expansion of space exploration. The field where they built the refinery in Amarillo, Texas, turned out to be very rich in Helium, and in more recent years, the U.S. Federal Helium Reserve account for about 30% of the world’s accessible supply. It is estimated that that reserve may run out of recoverable Helium in the next three to five years. There are about a dozen other sites worldwide, which are known to have helium deposits large enough to make it worthwhile to develop them. A refinery opened in Saskatchewan, Canada in 2014 and Qatar opened a new refinery in 2013, but other deposits have not yet been developed. The advent of superconductors, like those used in MRI machines, have also increased demand and, subsequently, prices. Helium can be cooled to four degrees Kelvin, and used to absorb the massive heat generated by the magnet and superconductor wire as they create the magnetic field. These applications are currently demanding about 20% of the annual world supply. The remainder is used across a variety of other applications ranging from lasers and coolants for reactors and space ships, scuba diving tanks, and weather and even party balloons. The world will not be running out any time soon. There may be some fluctuations in pricing and availability as the Texas deposit winds down and other sources around the world are developed. Keep calm and weld on. 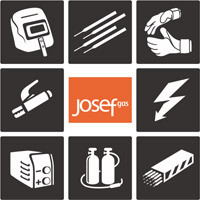 At Josef Gas, we have built and maintained relationships with our suppliers over the course of four decades, and we have long-term supply contracts in place to ensure that we are always able to have the gases you need, at the best prices available. Request a free quote online, or give us a call at 416-658-1212 to learn how Josef Gas can supply your industrial gas needs.